"Anyone who has ever dreamed of that perfect horse, or felt that connection and pleasure of enjoying the world from the back of a horse, should give this story a try.” Janet Veto, VIP Pets, Review. This is an inspirational story filled with love, hope and adventure. It is the third book in The Holiday Series, but can also be viewed as a stand alone story. I only regret not coming across this before Easter, so I could listen to it on the holiday. This was a family-friendly story, very fun and inspiring. I am more of a cat person, but horses are so amazing and have always fascinated me. I wish I had grown up around these majestic creatures! Being a short book, I finished it in one sitting. The story flows in a pleasant manner and advances quickly, so I believe children and teens can benefit from it without getting bored! Leslie Howard was a pleasure to listen to, she speaks clearly and voices her characters really well. Thank you Laura Hesse for the wonderful story! I truly enjoyed listening to this book on our recent family vacation. I feel like it is so hard to find books that keep the attention of children between the ages of 8-12, but this book certainly did and made our vacation drive so much enjoyable. 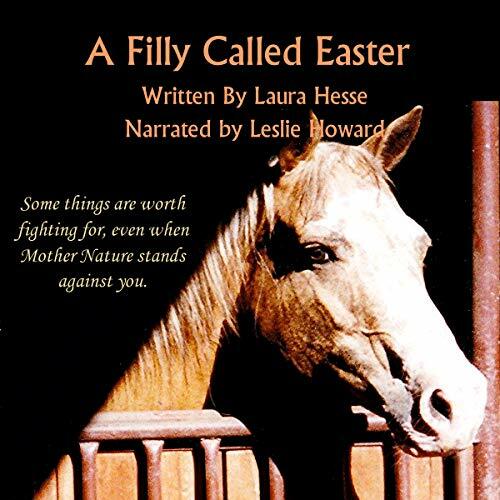 Laura Hesse did a beautiful job with pen to paper and sharing this story of a horse, that was born on Easter, only to also have a filly, born much too soon, and also on Easter. The story was brought to life by Leslie Howard, who did a superb job narrating and taking her time and not rushing through. Fantastic read! A young girl instantly falls in love with a young filly and convinces her father to let her have the horse. When the father finds out the horses story, he can’t refuse, but they could be headed for heartache. The filly is pregnant and just may be to young to survive. A Filly called Easter is a beautifully written and narrated story. A Filly Called Easter is a sweet book about a young girl that wants a barrel racing horse. At a livestock auction, she is introduced to Easter and immediately fell in love with her talking her father into bringing her home. The trials of having a young filly, who is pregnant too early had me listening intently. This story reached all my emotions. Leslie Howard does a great job narrating this story. I am looking forward to more from both Laura Hesse and Leslie Howard. I loved this book so much that it will definitely be accompanying me when I get my horse loving granddaughters! This book could have easily been written this year, in which some of us in the US got snow last night! I had listened to One Frosty Christmas about three months ago and was thrilled Laura Hesse teamed up with Leslie Howard, who had voice acted that audiobook, too. (Even though it does not indicate on the audiobook these horse tails are part of The Holiday Series.) These books all seem to be complete stand alone books. A Filly Called Easter also takes place in River Bend and Hannah (main character from One Frosty Christmas) also has a cameo appearance. A sweet, kind story about the compassion among strangers, friends, and the animals they choose to care for. Full of heartache, heart, and love, this is a wonderfully warm story to listen to any day of the year! This is not my genre, but I really enjoyed the writing and story. If you love stories of horses, this book is for you! The narrator did a great job, a little slow at times but her voice fit the story well. The ending dragged a little, but not too much. its such a sweet story about a girl that falls in love with a horse. and a sweet little town that comes together. it really tugs at your heart. I would think anyone who loves horses would like this story. The narrator did a good job bringing this story to life! I received this book for free in audiobook form, in exchange for an honest review. Anyway, everything was realistic, well written and well read. I ended up liking all the characters and liked how the story progressed. The "tornado" scenario seemed a little unlikely, but aside from that everything else sounded good. The narrator did a fine job. I have heard her narrate some other books and she stuck in my mind because she did a good job. She talks a little slow for some, but it works for me. In the end, a sweet story, good people, realistic setting and a sweet ending.